Arsenal: Is it now or never for Arsene Wenger to win title? The celebrations around the Emirates Stadium as Arsenal's players took the acclaim of their fans at the final whistle after their win against Manchester City illustrated the result's significance. It was not simply relief at surviving a late City rally to secure a deserved 2-1 win or delight at closing the gap on surprise Premier League leaders Leicester City to two points. This was the sort of victory that had Arsenal fans believing they can end a title drought that stretches back to 2004. Their best chance of a title in a decade? Arsenal have endured years of pain since 'The Invincibles' claimed the Premier League title after 38 unbeaten games - but the evidence is stacking up that they can finally end the wait. It is 10 years since they finished in the top two and only twice in the intervening period have they occupied one of those two slots after 17 games, as they do now. Only once since 2003-04 have they had more points than the 36 they have now, when they had 40 in 2007-2008 and finished third. A season of two halves? And for all Leicester's brilliance at the top of the table, the win against City came against a team many believe will ultimately emerge as Arsenal's closest rivals. It was a victory that delivered a psychological blow. This was Manchester City's fifth loss this season and no team has won the Premier League when they have lost five games before Christmas. It was a result and performance that will only add to Arsenal's confidence and self-belief as they search for that inner X-factor that has eluded them when they have been in the hunt for the big prize in the barren title years. "Our belief is strong," said Wenger. "We have a bit more maturity in the side now, which you could see in the game when we were under pressure and we could deal with it. "Every win strengthens the belief when it's a big game like that." The Gunners have nine more points than they did at this stage last season - they were 15 points adrift of leaders Chelsea 12 months ago - but a glance at the fixture list shows that tough tests await, with visits to Manchester City, Manchester United, Spurs, Everton and Liverpool to come. Arsenal currently have the edge on those other traditional rivals, Chelsea and Manchester United, adding a layer to the growing belief that it is now or never for Wenger and his team this season. Manchester City, as the game at the Emirates proved, are inconsistent this season, producing performances that are often below par. Manchester United are fading fast, without a win in six games and currently out of the top four and out of this year's Champions League to leave manager Louis van Gaal fighting for his job. Chelsea are an irrelevance in the title race, stranded in 15th place with only half of Arsenal's points and with a temporary manager taking charge in Guus Hiddink. The Gunners now have a four-point advantage over City and seven over United - and it is reasonable to suggest this is an opportunity that might not present itself to Arsenal as readily again. Are Manchester City, Manchester United and Chelsea likely to be as vulnerable next season? City may well have Bayern Munich coach Pep Guardiola in charge by then and have limitless funds to back him. Serial winner Jose Mourinho could be in the dugout at Old Trafford with a burning desire to prove a point after his sacking, while Chelsea owner Roman Abramovich will be ready to back the next high-profile manager through the door at Chelsea with a serious transfer kitty. Join the dots and this is Arsenal's best opportunity in recent memory - and one they would never forgive themselves for squandering. Arsenal's belief they can win the league should not simply come from the weaknesses of those they normally count as their title rivals. It should come from their own improvement and increasing confidence. The pieces of Wenger's jigsaw look to be coming together but they must now fight off what has often been their fiercest enemy - themselves. Too often Arsenal have been the team that cannot be trusted when the pressure is on. Can they change that habit of a recent lifetime? There is a growing body of evidence that they can, thanks to the introduction of one vitally important new face and the development of those who have inhabited the Emirates Stadium for some time. Goalkeeper Petr Cech arrived from Chelsea for £10m in the summer - a reluctant sale by then boss Mourinho - and he has been a transformative figure, as he proved against City with a performance that emphasised every bit of his experience. The 33-year-old was assurance personified throughout, exuding calm and offering a comfort blanket to Arsenal's defence in a frantic finale after Yaya Toure's late goal offered the possibility of a point City barely deserved. It is not simply on the pitch where Cech will be a figure of such influence. Having won three Premier League titles with Chelsea as well as the Champions League, he knows what it takes to win major trophies and his experience will be invaluable in the months ahead. Mesut Ozil is proving why Wenger spent £42.4m to bring the Germany World Cup winner from Real Madrid in September 2013 with his 15th assist of the season for Theo Walcott's goal. And Walcott and the much-maligned Olivier Giroud are proving a potent and consistent goal threat. Walcott's goal was his 13th in 17 Premier League appearances and while the debate around Giroud's class at the highest level may continue, the statistic of 12 goals in his last 14 matches demonstrates his value. If Arsenal can get their biggest asset of all, Alexis Sanchez, fit and playing regularly after his hamstring injury then Wenger's side have the sort of quality that gives them a real chance. What must Wenger do in January? Wenger was heavily criticised - with some justification - for his failure to spend on a high-class holding midfielder in the summer, as well as on a world-class striker. Goals have not been a problem, but the suspicion remains his Arsenal squad needed more strengthening and the wisdom of Wenger's refusal to buy an outfield player will only be fully measured at the end of the season. History tells us Wenger is never busy in January and the sort of class he needs is usually unattainable because they are either playing for clubs in the Champions League or in the hunt for the Premier League. Candidates who could seriously improve Arsenal and are able to be signed will be in short supply, especially for a manager who is notoriously selective about how he spends his money. 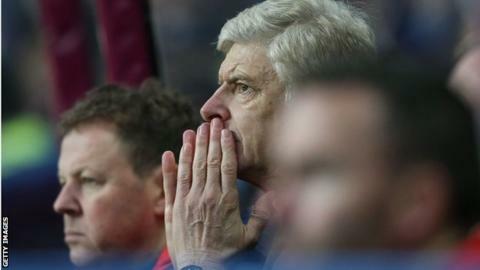 Wenger has no recent form for buying big in January to bolster his squad, so only time will tell if he changes strategy; it is likely to take the emergence of someone special and who is surprisingly available for him to alter his well-trodden transfer course. This means his main task through January - and indeed the rest of the season - is to get all of Arsenal's big players such as Sanchez fit and playing to keep them in contention until the likes of Danny Welbeck, out until February with a knee problem, and Santi Cazorla, missing until March with knee ligament damage, can add depth. If he can do this, and maybe pull off a surprise in the January market, then Arsenal's wait really could be over. The Gunners will never have a better chance.